The BURGER KING® brand first arrived on Malaysian shores in 1997 when Cosmo Restaurants Sdn Bhd opened the first outlet at Sungai Buloh Overhead Bridge. 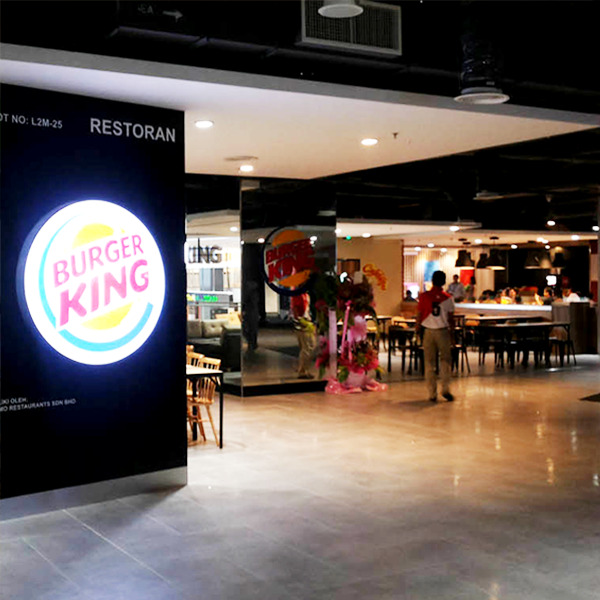 Today, the franchise holder which owns the development rights for the BURGER KING® brand in Malaysia, excluding KLIA and East Malaysia, reaches out to discerning Malaysian customers via its rapidly expanding network of 45 outlets and counting. Among the top QSR (Quick Service Restaurant) chains in the country, its growing customer base enjoys the best-selling, signature flame-grilled WHOPPER sandwiches as well as other top BK favourites while dining and relaxing with family and friends at its outlets, or in the comforts of home and office when they order to go or call for its speedy delivery service. All BURGER KING® beef and chicken patties are 100% certified Halal and the company only uses fresh vegetables that are locally sourced from around Malaysia.